Steve McQueen looking cool while keeping warm. Has anyone done it better? Sunglasses and the Benrus watch further enhance this classic modern look. “An American original” is how photographer William Claxton describes Steve McQueen in his book, Steve McQueen: William Claxton Photographs. That, he was, in terms of style, too. Looking at photographs of him from the book, many from his private life, one can tell that his wardrobe was brim full of Ivy classics, from his signature G9 Baracuta Harrington jacket, knitted sweaters and polo t-shirts, to ankle-gazing khakis and worn-in sneakers. 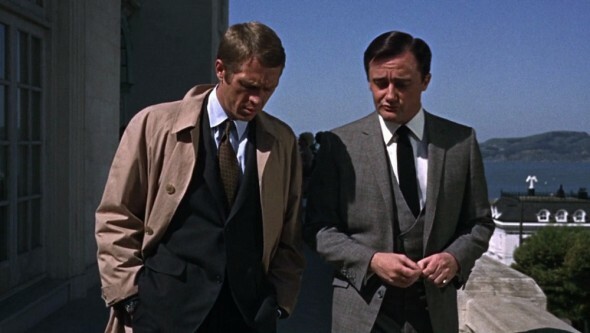 He was one of Hollywood’s advocates of classic American clothing. It was his movies, after all, that elevated his low-key, functional, visceral style to cult status. 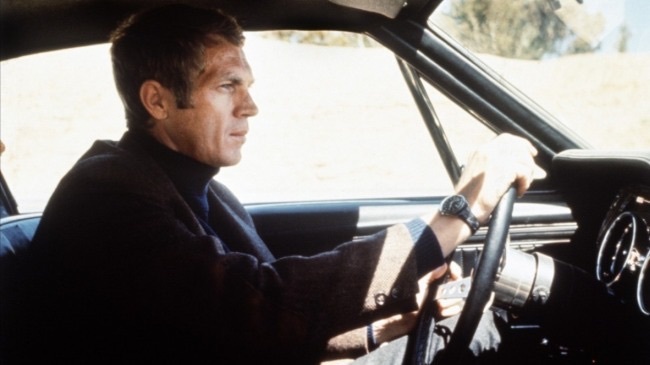 Bullitt (1968) is at the forefront of these films, and this is thanks to director Peter Yates, too, who understood the McQueen image and molded the character on Steve’s own style and personality. A hip personality, a special kind of existential cool, detached and rebellious, his own guy, a tough guy, who loves cars and speed (he convinced Yates to include an extensive chase scene in the film, which resulted in a eleven-minute sequence and one of the most famous movie car chases ever made) and has a beautiful woman (Jacqueline Bisset) by his side. That’s McQueen, all right. 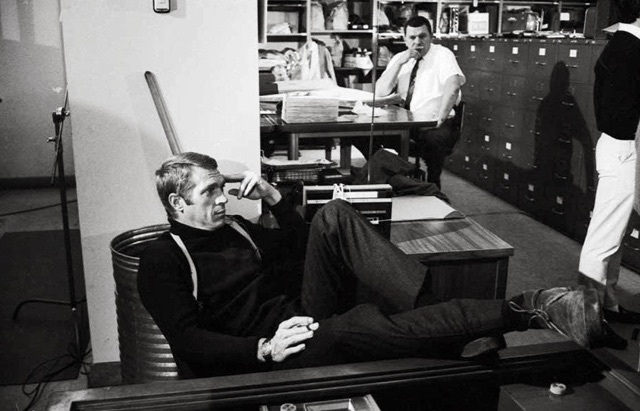 As the anti-hero cop Frank Bullitt, he set the standard for Ivy cool in his navy blue cashmere turtleneck sweater, the brown tweed sports jacket, and those trademark brown suede, crepe soled chukka boots. It is, however, that custom-made three-roll-two jacket, undarted with a soft cut in brown herringbone, with its suede elbow patches, that defines his appearance in Bullitt. An element that, on him, looks fresh, un-precious, purposeful, belying its traditions, and setting the best example, still, after almost half a century later, of how to wear a tweed jacket in the city. 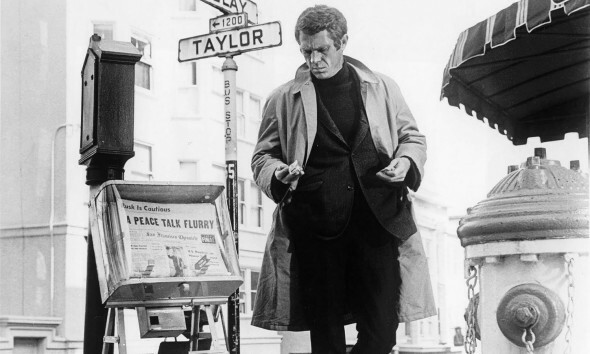 Steve McQueen remains the best dressed police lieutenant (sorry, Clint ) ever to have hit the streets of San Francisco. When it comes to outerwear, Frank Bullitt is part of the school of thought that prefers the more functional single-breasted raincoat, instead of the trench. Both were highly regarded in the Ivy ranks, both are suitable for every occasion, both are established threads of the male wardrobe. 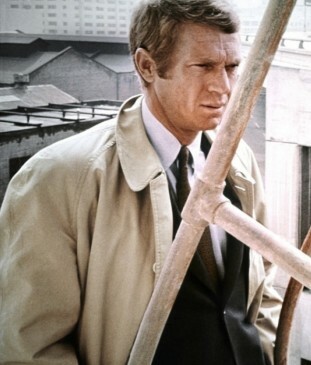 But as it is well pointed out in the book The Ivy Look: Classic American Clothing , “the slimmer aesthetics [of the raincoat] seem to harmonise well with the simple shapes of the rest of the wardrobe”. I, for one, prefer the mac for men for the same reason. The suit is undarted and has soft shoulders and lapels, but still looks smart – this contrast is another detail indicative of the preppy dressing code. 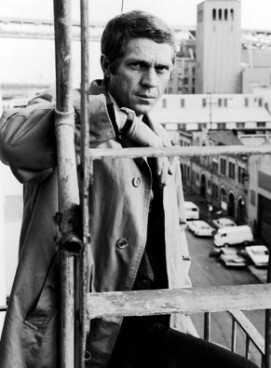 The costume designer for the film was Theadora van Runkle, who would also fit McQueen for The Thomas Crown Affair, but whereas in the latter film he was groomed to the last detail (he was looking to change his screen image and be cast against type), in Bullitt he didn’t just slip into the assigned movie wardrobe. He might just as well have played himself. Photographed by Barry Feinstein on the set of Bullitt. 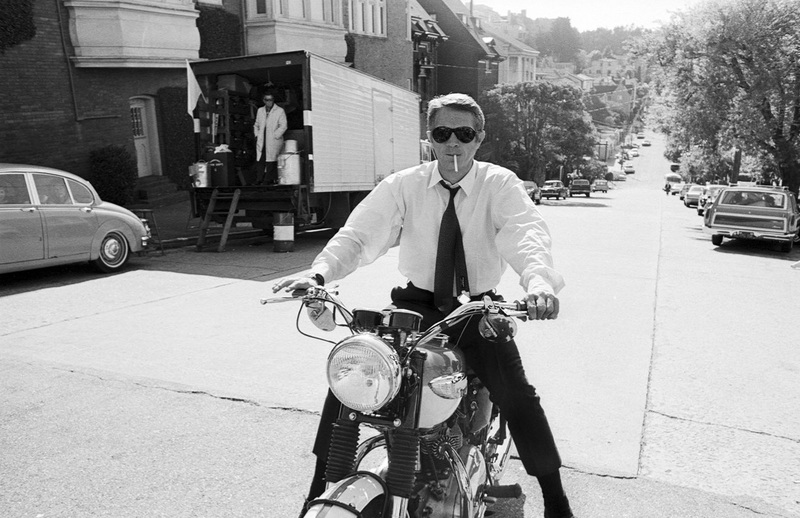 Forgoing his suit jacket and mac, with his shirt unbuttoned at the neck and a loose tie knot, he is just as natural riding his beloved motorbike as he would be in jeans, t-shirt and his Baracuta jacket. Here (photo above) is a better look at the superb, rich blue colour of the roll-neck (extra points for the slightly, just right, loose fit that I consider to be a very mannish detail) and the charcoal of the trousers, and the beautiful, high-quality textures of these pieces. 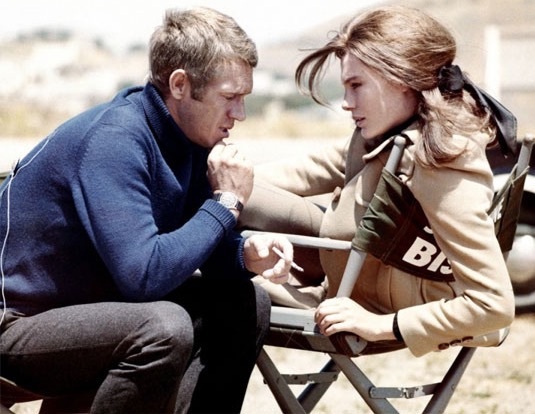 With his co-star, Jaqueline Bisset, on the set. “I think every one of Steve’s leading ladies was smitten with him and he usually treated them with respect.” I like this remark from William Claxton. The photographer was a close friend and would often document on film the actor’s on- and off-set life. 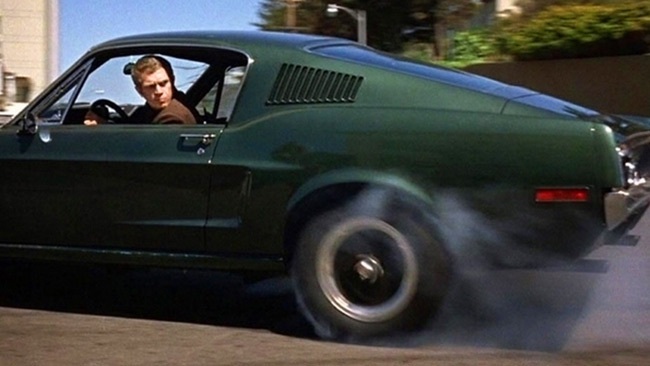 McQueen drove a very fast, dark green 1968 Ford Mustang GT 390 in Bullitt. Off set, however, he drove a Ferrari ’63 250 GT Lusso Berlinetta and a Jaguar XKSS, in keeping with traditional Ivy League style. East Coast Ivy Leaguers always favoured foreign cars, and Ferrari and Jaguar XK-120s were on top of the list, alongside British MGs, as well as Volkswagen Beetle – preferred by Paul Newman, for example, another Hollywood proponent of the preppy style, who liked to stay away from the movie star image of expensive sports cars, although his various convertible Beetles were rumored to have been equipped with Porsche engines. But I don’t think that McQueen’s choice of car brands had much to do with any desire to show off, but simply stemmed from his love for fast cars. Period. I don’t think he ever forgot where he came from, the emotional hardship of his childhood as a poor, rough street kid. He was an avid racer and loved to share his passion with just about anybody who happened to be around, and would often take a car, load it with his buddies and go for a ride. He was a man’s man – on any lesser man even the practicality of the Ivy classics wouldn’t have had the same rugged appeal. 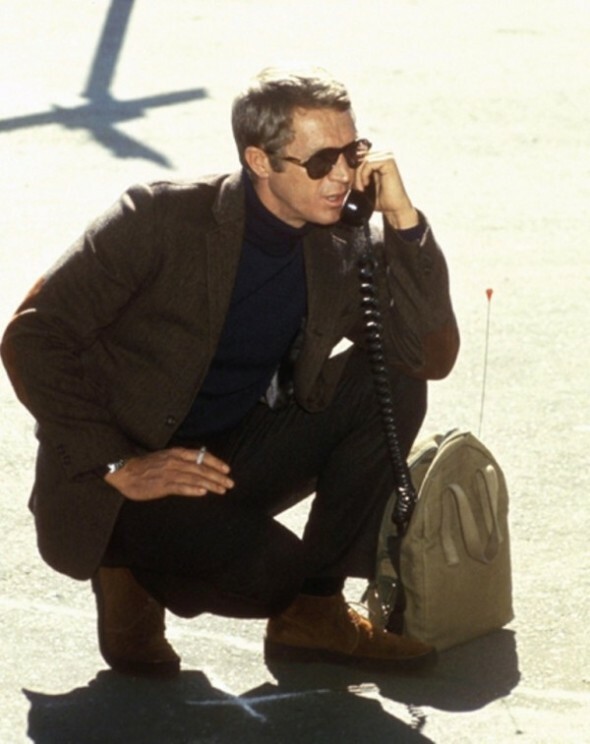 Update: Citing the sources below, I initially wrote that the sunglasses Steve McQueen wears in the film are Persol 0714, but a reader pointed out that they weren’t. This article has also appeared on The Big Picture magazine. A timeless piece you wrote here! Just as Steve McQueen was 🙂 Thanks, Ada! Besides, if someone could help me determine the brand name of these glasses, I would be delighted.